KJIPUKTUK (Halifax) – A new report, Break the Barriers, issued by Citizens for Public Justice, a national faith-based social justice group, informs us that in Nova Scotia an awful lot of people are awfully poor. More so than in Canada overall, and more so than most any other province. Not to say that Canada isn’t a mess as well. 1 in 7 people live in poverty, that’s 14.4 percent or 4.9 million people. 46 percent of children in single parent families live in poverty. Same for 34 percent of new immigrants and refugees (we’re a welcoming country, remember), 29 percent of seniors, 25 percent of indigenous people. 60 percent of First Nations children on reserve live in poverty. The rate of poverty in Nova Scotia sits at 15.3 percent. That’s higher than any other province in Atlantic Canada. 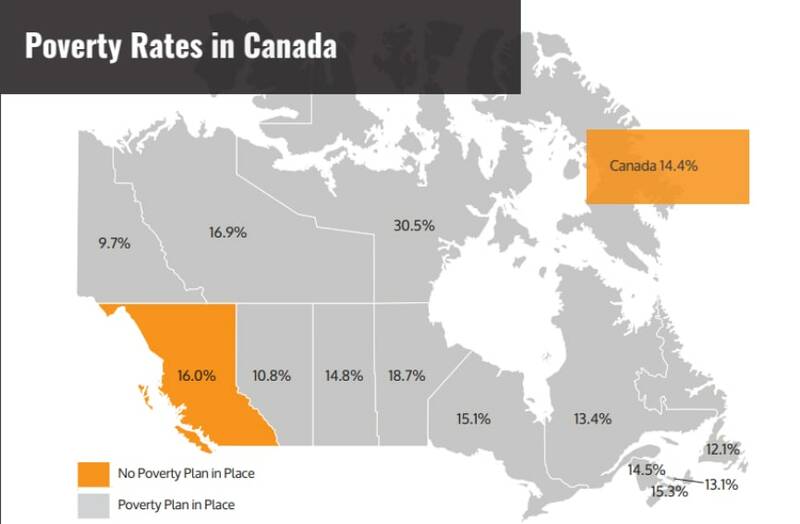 Of all Canadian provinces only Manitoba and British Columbia have a higher poverty rate than Nova Scotia. Of large Canadian cities Halifax is number 11, with a poverty rate of 14.2. Traditional Halifax rival Moncton is only number 17, with a poverty rate of 12.8 percent. Take that, Moncton! Three Nova Scotia towns are in the top twenty medium-sized cities with the highest poverty rates. Cape Breton is number seven, with a poverty rate of 19.5 percent, although that appears to include not just Sydney but rural Cape Breton as well. Kentville is number 17 with 16.2 percent. Right behind Kentville is New Glasgow, with a 15.8 percent poverty rate. Although the illustration suggests Nova Scotia has a poverty reduction strategy, that document, issued in 2009, never had any teeth and is no doubt collecting dust somewhere in the far reaches of Province House. All numbers are for 2014, and the source is at all times Statistics Canada. Poverty is defined through the Low Income Measure (After-Tax) calculation. It gets very complicated very quickly. One of these days I will do a story on all the different definitions of poverty that are out there. Why don’t we have a guranteed income like they tried in Dauphin Manitoba many years ago?